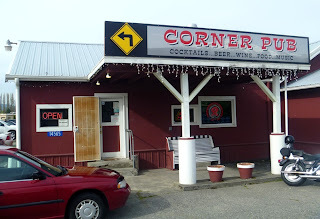 While driving between Skagit Valley tulip farms, across the fields of the old flood plains of Samish Bay, we suddenly came upon the Corner Pub. The pub is on the outskirts of Bow, Washington, a virtually non-existent town that once hosted a thriving sawmill community and railroad station. Bow, then "Brownsville," grew up around the sawmill built by William Brown, in a location that once hosted a village that the natives called "Noo-wha-ah." They would reach the village by canoeing the various rivulets of the old salt chuck, which were later merged by the whites to facilitate water transportation, and called the Samish River and later Edison Slough. After the railroad station closed, the timber supply declined, dikes organized the water flow, and highway and road changes removed all but a trickle of transit from Bow, the area has become a more spread-out community of farms. The Corner Pub/Tavern is a friendly neighborhood bar which has been around a surprisingly long time and originally seated 10 people. It was constructed in 1928 and became a bar shortly after prohibition. Locals welcome you to share a table, chat over baskets of peanuts, and toss the shells on the floor. We stopped there largely because we thought it doubtful that we'd ever be quite out this way again, but we were glad we did.